A few weeks back I did a review on the newly released razor called “The Single Edge” a real great razor and now Supply Provision has sent me the follow up to their new collection of wet shaving products. One is a tallow shave soap and the other post shave tonic. ingredients are doing to help your skin. 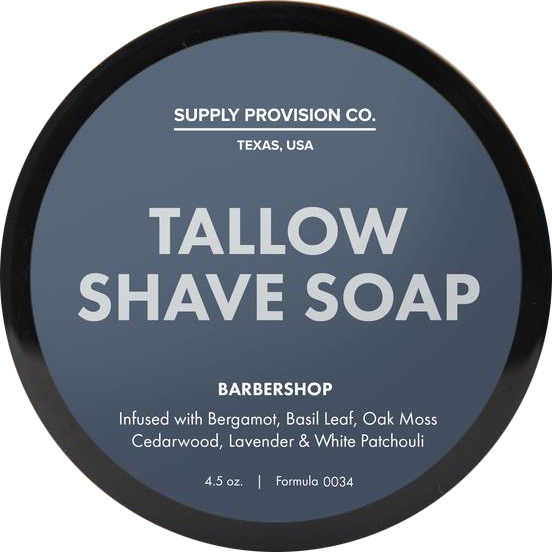 The top label has in bold big letters Tallow Shave Soap with the very small Barbershop near the bottom denoting the scent. I would have made the word barbershop much bigger. It’s almost like being a tallow based soap is what’s important here and thats a good thing but they should give the scent a little more love. The sent plays a big part for me in purchasing a shaving soap and by looking at this label I get the impression they don't feel the same way. This 4.5oz puck is smaller than the tub it comes in and can be taken out of its container. As for those of you who load the brush from the tub I could see the puck moving around inside during this process which could be annoying to some. I happened to noticed the formula 0034 near the bottom of the top label so if I'm reading this right some serious work has been done to create this product. This barbershop scent is made up from infused bergamot, Basil Leaf, Oak Moss, Cedar wood, Lavender & White Patchouli. For me it’s a very clean scent one that pairs perfectly with the supplied post shave tonic. The scent strength is on the upper mid range from the tub and stays pretty much the same increasing slightly during the shave. I always bowl lather and had no problems placing the desired amount in my captain’s choice bowl. As soon as I added the proper amount of water things started to happen I must have added way too much at first but then a rich creamy lather was achieved. The shave went very well having no issues with slickness or glide and the post shave feel was very good. I finished it off with the post shave tonic. No alcohol in this product so no sting. The scent is made from infused bergamot, juniper, lavender, jasmine and patchouli oils. Very refreshing and like I said pairs very well with the shaving soap. If you need a reference of how it feels its like putting on Lucky Tiger face wash. So another great shave with both products performing very well. If you find you want to give them a try you would not be disappointed. If your thinking of purchasing The Single Edge razor you just might want to include them with your order.